The Petoskey and Harbor Springs area has a historically rich past. Petoskey Yesterday offers both walking and driving tours of historic Petoskey and sites associated with Ernest Hemingway. As a young man, Hemingway summered in the area and was even married here in 1921. Did you know that the Petoskey and Walloon Lake areas inspired Hemingway to write the Nick Adams Stories? Harbor Springs was founded by the Jesuits and was once called L’Arbre Croche, which means Crooked Tree. In 1847, L’Arbre Croche had the largest concentration of Indians in the state. French traders renamed the area Petit Traverse, or Little Traverse. The village was incorporated as Harbor Springs in 1880. Indian residents and white settlers of Little Traverse subsisted mainly on fishing, agriculture and trapping. In 1853, however, the establishment of Richard Cooper’s trading post and general store marked the beginning of commercial operations in the village. Lumbering was the dominant industry in Harbor Springs from 1880 to 1920. Other thriving businesses included Emmet County Bank, which still operates today as First Community Bank. In 1895, Joseph and Martha Juilleret opened a boat livery and an ice cream parlor. The building which housed these businesses was the south half of the Juilleret’s restaurant (which is now closed) and had passed through generations of the Juilleret family. Vestiges of the past also live on in many of Harbor Springs’ visitor attractions. The scenic M-119 Shore Drive was once part of the old Mackinac Trail used by the Indians. Staffords Pier Restaurant was once known as Booth’s, a speakeasy that operated during the 1920s. The picturesque town of Petoskey, located on Little Traverse Bay, started in 1852 and was known as Bear River. Presbyterian Missionary Andrew Porter arrived and began teaching and helping the Bear River Indians. In 1873 the town began to grow. On November 25th, the Grand Rapids and Indiana Railroad pulled in for the first time. Within one year, Bear River was renamed Petoskey, after an Ottawa Indian Chief, Chief Pet-O-Sega. “Pet-O-Sega” means the “Rays of the Rising Sun”. Soon, a store and two hotels were built and visitors began swarming to the small waterfront town. 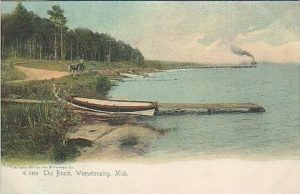 Lumbering was a mainstay for Petoskey during the late 1800’s. Lumber from our region was instrumental in helping rebuild Chicago after the Great Fire. 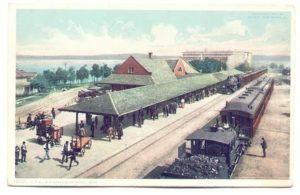 Passenger trains and steamships played a major role in the growth of Petoskey. The passenger depot for the Chicago and West Michigan line today houses the Little Traverse History Museum. Petoskey’s oldest building is the St. Francis Solanus Mission, built in 1859. Symons General Store, built in 1879, exemplifies the trend toward brick construction in Petoskey, an attempt to safeguard against the destruction fires caused in other area lumber towns. The building now known as Stafford’s Perry Hotel was Petoskey’s first brick hotel. At the turn of the century, the Perry was advertised as the only fireproof hotel in town and is the only original resort hotel still operating in Petoskey. 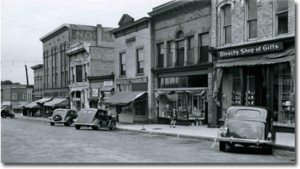 For more information about Petoskey’s history, you may contact the Little Traverse History Museum, 231-347-2620.